followed by decorating the church for EASTER! Please stay for a bowl of chili afterwards. 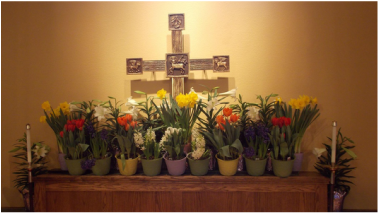 The season is marked with special services and liturgies, beginning with Ash Wednesday and concluding with the Easter Sunday. The liturgies are listed here. Ash Wednesday - Begins Lent with a special service in which the priest marks our foreheads with ashes in the shape of a cross. Palm Sunday - Recounts Jesus' triumphal entry into Jerusalem, and then turns towards the Crucifixion. Palm Sunday is the start of Holy Week. Maundy Thursday - This service in the evening recounts the Last Supper, which was the first Eucharist. We remember Christ's eternal promise to sustain his followers in sacred meal, and we wash each other's feet as a sign of service and love. Good Friday - The liturgy today honors Christ's crucifixion, his courage to live the truth even to death. We hear St. John's passion gospel and honor the holy and life-giving cross. Holy Saturday - A short liturgy recalls Jesus Christ's descent among the dead to bring liberation to the souls there. The Great Vigil of the Resurrection - At night, new fire is lit as the church gathers to hear the stories of salvation from the Hebrew Scriptures. At the appointed time, the Resurrection is proclaimed with ringing bell fanfare and we rejoice with the first Eucharist of Easter. This is the highlight of the whole year, and if you haven't come to the Vigil before, you must join us! Easter Sunday - Lots more people come to church this day, but in a sense, it's "just another Sunday," which means that, like every Sunday, it's a celebration of Christ's resurrection from the dead. But really, if you want the full experience, come to as many of these Holy Week liturgies as you can. Lent Madness! Each year, during Lent, members of St. Matthias' participate in Forward Movement's fun, engaging way for people to learn about the men and women comprising the Church’s Calendar of Saints. Members fill out brackets prior to Ash Wednesday, and give a small donation that goes into a common fund. They then compete for the right to direct the use of those donations for a charity of their choosing! Stations of the cross 2019, will occur on Maundy Thursday prior to the Agape Supper and Maundy Thursday service. led by Rev. Erin and featuring Teena Orling.